"It's easy to make and follow, for anyone who likes a little spice." Place processed cheese spread in a microwave-safe bowl. Microwave on high in 2 minute increments (stirring at each pause) until the cheese spread is melted. While the processed cheese spread is melting, brown sausage in a small skillet. Drain well. Place broccoli in a microwave-safe bowl, cover, and microwave on high for 5 minutes. In a large mixing bowl, combine melted cheese, sausage, broccoli, and diced tomatoes. Stir well before serving. Try this quick, spicy white cheese dip. Made this without the broccoli and it was a hit. Thank you. pretty good. everyone ate it and gave it a 5. I like a good bit of jalapeno in it as well as diced green onion. also used white cheese instead of american. I make this recipe without the broccoli and it is also very good. For guest who do not like spicy try the non-spicy pork. For those who want extra spicy use Mexican processed cheese. I've made this before and it's always hit. This time, however, I mixed a pound of sweet italian, ground sausage. It's amazing. 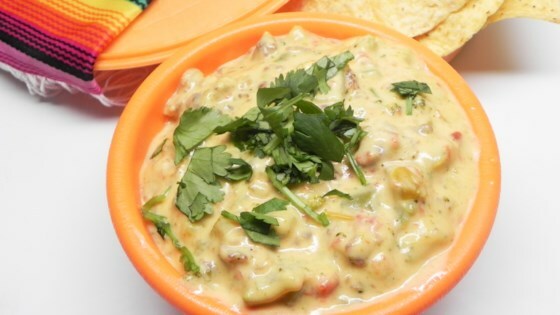 Made this for the Superbowl and it was the most popular dip served. I forgot to get frozen chopped broccoli, but will use it next time just to see how the flavor changes.